Chicken Fried Rice is rated 4.3 out of 5 by 71. Rated 5 out of 5 by Pama from Quick, Easy, Warm side dish with no fuss. I am a landscape photographer. I'm always on the go and I eat on the go taking a small rice cooker/steamer with me running it off 9 volt or solar. I need something warm, quick, easy to fix, easy to clean up afterwards, and something that always tastes great...Knorr products delivers that for me! A few Asian sides, some canned chicken or beef, my small portable rice cooker/steamer and I'm set! Ready to hit the road or trails again while feeling full and satisfied with a nice warm meal. Thank you Knorr! You make my life easier nearly everday, especially while road-tripping in the wilds looking for that next great landscape. Rated 5 out of 5 by AJO1974 from Great as a side dish or main dish! A few months ago I decided to try this rice mix, "Asian Sides - Chicken Fried Rice" since I enjoy fried rice. I was not disappointed - very delicious! I like the fact that Knorr added peas and carrots to the rice -- it gives the rice mix both flavor and texture. Furthermore, I like the flexibility in mixes like this to allow you to experiment and having a recipe on the back to further enhance the rice mix is a plus! I can make this in microwave and comes out perfect. I hope Knorr never stops making this mix! Thanks for making my dinners better! Rated 5 out of 5 by none from Just like resturant I cooked this per instructions. Scrambled 3 eggs and added to the pan. . Cooked till eggs were done. Added diced cook chicken breast. Cuts sodium intake down. Tasted great. 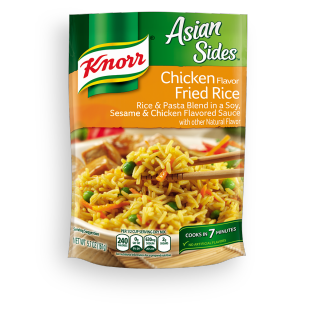 Rated 3 out of 5 by SRBAtes from Knorr Asian Fried Rice I have tried this item and was pleased with the outcome. Quick, easy average flavor. I have experimented adding diced chicken. However, the sodium content must be considered with it.